The below products are in our Australian sequence. For resources in the satpin or 'Letters and Sounds' sequence, please download this order form or email us at info@getreadingright.com.au. 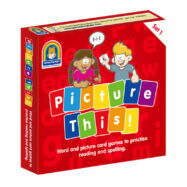 Adhering strictly to the principles of Synthetic Phonics, these 100% decodable word and picture cards are the ideal resource for children to practise decoding for reading and segmenting for spelling, as well as expanding their vocabulary. Delivery: Orders take 1-3 days to be processed. Delivery of your order can then be expected 1-2 weeks from the dispatch date.